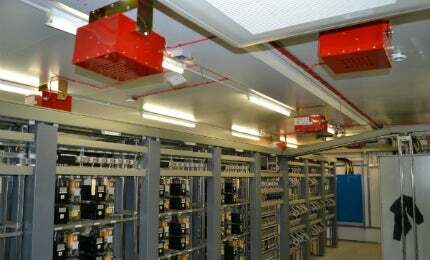 FirePro Systems specialises in condensed aerosol fire extinguishing technology for power applications. The company has a distribution network in more than 75 countries, providing safety systems that save lives in more than 110 countries. Products are manufactured under strict internationally set industry standards. Condensed aerosol fire extinguishing technology came into prominence as a result of the Montreal Protocol of 1994, which banned ozone depleting substances such as Halon1301 and other halocarbon and chlorofluorocarbon-based substances. FirePro products are suitable for fire classes A, B, C and F according to EN2 classification, and A, B and C according to NFPA10 classification. FirePro’s systems can be referred to as condensed aerosol fire extinguishing generators or units. They have numerous benefits, including reliability, effectiveness and credibility. FirePro’s solutions have a range of advantages compared with conventional gaseous systems, including lower initial and long-term ownership cost, pre-engineered solutions, weight and space-saving properties, easy installation, no integrity piping tests, fittings or pressure cylinders and easy and cost-effective maintenance, with no hydraulic tests, weighing, pressure / leak detection and filling. They are also non-corrosive, non-toxic and non-conductive, and do not deplete oxygen levels. FirePro solutions are total flooding agents that are flexible and adaptable. They can be installed for fire hazards that are impracticable or not financially viable, to protect other technologies. The company’s condensed aerosol fire extinguishing systems have a modular design and can protect large volumetric enclosures, such as warehouses and offices. The systems can be linked with any smoke, heat, flame, aspiration, gas or other fire detection technology to produce a complete system. FirePro also supplies one of the smallest autonomous and automatic fire extinguisher systems, which is used to protect internal volumetrically small electrical panels or other power utilising devices / equipment, which is often where fires start. In the event of a fire occurring in such potential sources, it is extinguished locally, which stops it from spreading outside the source. Consequently, no additional fire-fighting services are required. FirePro fire extinguishing systems use the latest generation of the fluidised bed combustion (FPC) solid compound, which consists of potassium salts with non-pyrotechnic materials, such as nitro-guanidine or nitro-cellulose. Upon activation, the FPC is transformed into a rapidly expanding, highly efficient and effective fire extinguishing condensed aerosol. It is autonomously distributed evenly in the protected enclosure using the momentum developed during the transformation process. It extinguishes fire not by oxygen depletion or just cooling, but instead by interrupting the chemical chain reactions present in the flame. FirePro aims to provide a more efficient, affordable fire-fighting ability to as many people as possible, with every factory, office, shop and home having the security of fire protection.